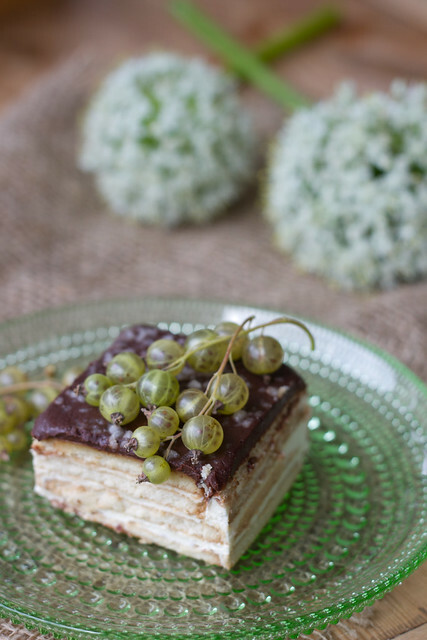 Here's a true Estonian classic - a layered cookie cake. 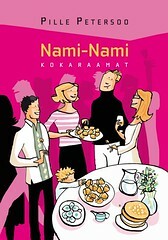 If you've been reading Nami-Nami blog, you may remember that an Estonian cookie cake was also featured at the festive spread we served for Average Betty few weeks ago. 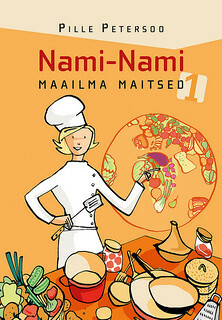 It's a popular cake on children's birthday parties and on September 1st (the day all Estonian kids go back to school). * There are just a few ingredients. * It's pretty cheap and affordable. * There are endless variations - you can use different flavoured cookies, different cream, different decorations. * The cake takes about 10-15 minutes to assemble, and every kid can make it, even small ones. Photo by Hele-Mai Alamaa (Pere & Kodu) as part for the cover story back in February. As far as the cookies go, you need rectangular unfilled cookies - either plain or chocolate-flavoured or any other flavour you like. The cookies shouldn't be more than 5-6 mm (1/4-inch) thick. In Estonia any flavour produced and distributed by Estonian Kalev or Latvian Selga would work, elsewhere you could try with Bahlsen Leibniz's Butter Biscuits, or LU's Le Petit Beurre biscuit cookies, for instance. Sounds familiar? 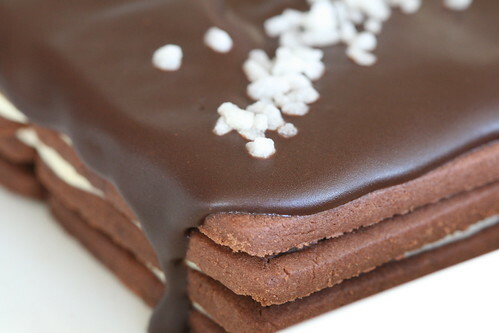 There's a similar, yet different popular cake in Germany, called Keller Kuchen (Cellar cake) or Kalter Hund (Cold Dog), or radiokaka in Sweden, where butter cookies are layered with chocolate and coconut butter cream. NB! Make this cake at least 4 hours earlier, preferably day before, so the sour cream has time to soften the cookies and make the cake more cakey. You can top the cake with chocolate glaze and decorate it just half an hour before serving. Dip 12 to 15 cookies into the milk or coffee and place onto a suitable cake tray (I usually use 3x5 cookies or 15 in total, depending on your cake tray, you may prefer 3x4 pattern, resulting in 12 servings). Now spread about a third of the sour cream evenly on top of the cookies. Continue with 3 more cookie and 2 more sour cream layers, finishing with the cookie layer. Cover the cake with a cling film and place into the fridge to soften. To make the chocolate glaze, break the chocolate into pieces and place into a small saucepan with butter and fresh cream. Slowly heat on a medium heat, stirring regularly, until the glaze is smooth and glossy. Spoon over the cake, spreading it evenly all over the top. (If using shredded coconut or pearl sugar for garnish, do it now, so it sticks into the chocolate glaze). Place back into the fridge to harden. To serve, cut the cake into neat squares (or rectangles, if your cookies weren't square), or smaller slices, if you prefer. Garnish with berries, if you wish (I used the wonderful green variety of blackcurrants, Vertti, that I was talking about in a recent post). Aitäh!/Thank you. I needed a cake idea for this coming Sunday and I think I just got one. I use both plain and chocolate - flavoured cookies dipped in dark coffee, with curd cheese as filling (1.5 kg curd cheese + sour cream + some suggar and vanilla for 6*4*5 cookies cake). 1st, 3rd and 5th layers are plain cookies, and 2nd and 4th are chockolate flavoured. And after 2nd anf 4th layers I add uncooked cranberry jam (toormoos) on curd cheese filling. Grated chocolate is used for decorating. Mu lemmik - my favourite. That looks delicious. I use a mixture of ricotta cheese and sour cream between the layers and also put berries between the layers. Must make one again soon! I have used Maria biscuits and have put kohupiim mixed with whipped cream between the layers along with macerated strawberries. Many years ago I had a 'cake' that consisted of layers of chocolate wafer biscuits and whipped cream, shaped into a log. Last time I saw those biscuits in the store, the recipe was on the box. People who don't like the sour cream(too much fat) can use plain Greek yogurt too.Sometimes I add some Halvaa too to the yogurt mix. Väga hea idee. Mul ongi paar küpsisepakki kodus ootama jäänud millal neist midagi loon. This layered cookie cake treat is very delicious! Thanks for sharing the recipe. Oh I love this shot of all of you!! I do a similar cake, chocolate graham crackers, layers whipped cream instead of sour cream, with a layer of fruit, then "frosted" with whipped cream and frozen. But I love the looks of this with the chocolate on top! Made this cake for our Labor Day dinner. 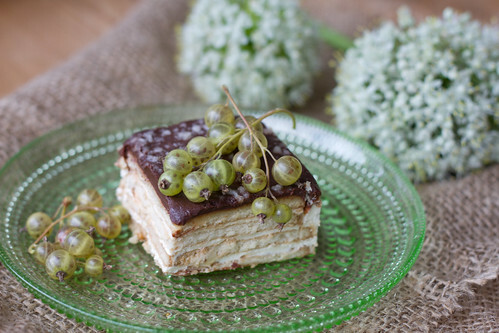 Very delicious and No baking! Big hit! Tere Pille! My Estonian son turned 14 today. I had been planning to make this cake for him since I saw this post. Finding square or rectangular cookies in the US is very hard! The only ones I could find were spice cookies. The smell reminded me of Old Town at Christmas. Instead of chocolate, I used coffee for the frosting. Anon. - that's a rather fancy version you're making!! I've made curd cheese cream versions before, but over the years have come to love this plainest version. But I do alternate chocolate and vanilla cookies sometimes! Gitta - you'd be welcome! Evi - need to look up those Social Tea biscuits one day! Leena - aren't Maria biscuits round? Gretchen - thick Greek yogurt would work as well, indeed. It's only now slowly becoming available in Estonia, however, and still just in Tallinn, so sour cream is still most popular. Dianne - kas tegid küpsisetorti?? kketchupz - did you come up with a good vegan version?? Alanna - intrigued, for sure! Anon - glad to hear you enjoyed it! Hovkonditorn, yummy tasty, Jeff - thank you!! Alice - I'm so pleased to hear that your boy loved this! Spiced cookies would work as well, esp. as the filling is so simple, so it balances the spice a little.. Happy Birthday to your son from me, too!! Made it last night - wonderful recipe, as simple as it gets and also very tasty.